Football - Copley Utd v Midgley Utd. Steve Fullard for Midgley scores past Copley's Johnny Jones and keeper Craig Skinner. Calder ‘76 boss Rob Kenworthy fined himself after the reigning Halifax AFL champions let a three-goal lead slip away to Greetland. Kenworthy will put £10 into club funds after admitting he lost his cool during the 3-3 Premier Division draw at Goldfields. The visitors looked in control with Sam Cartwright to the fore. Cartwright opened the scoring midway through the first half, set up Max Crossley to make it 2-0 just before the break and then bagged his second after good work from Ricky Topham and Crossley on 50 minutes. Calder then struck the bar and looked in such control that Kenworthy brought on two substitutes, including late-arriving goal ace Remi Allen. However, Calder lost their discipline and shape as 50-50 decisions went against them and Greetland stormed back to share the spoils with goals in the last 20 minutes from Adie Ford (two) and Karl Jowett. Kenworthy said: “I was blaming the referee when I had only myself to blame. “It is very, very rare that I lose patience but my passion and frustration got the better of me. Illingworth St Mary’s stretched their 100 per cent record to 10 games with a 6-2 win over Sowerby United. The league leaders started strongly against a nervy Sowerby side and looked set for a big win when Joe Griffin and Phil Livesey scored in quick succession around the 15 minute mark. Sowerby settled and started to get back into the game. They were rewarded when Corey Henderson raced clear and finished well. lllingworth added a third early in the second half through man of the match Damian Randell but Sowerby hit back when Dan Crosland scored from the spot after Harvey Walsh had been upended. A defensive blunder let in John Booth for Illingworth’s fourth before a stunning volley from Gareth Gaukroger put the game out of Sowerby’s reach. Booth wrapped up the scoring late on. Northowram are up to fourth after a 6-3 win away to Hebden Royd Red Star on a very heavy surface at Mytholmroyd. Archie Griffiths’ long ball set up Lewis Oldridge for the opener after eight minutes but Griffiths’ slip let in Will Chadwick for the equaliser two minutes later. The mercurial Oldridge cleverly turned his man, rounded the keeper and slotted home from a narrow angle on 26 minutes and the visitors made it 3-1 on 40 minutes when Oldridge set up Matt Calland to turn the ball into an empty net. A Red Star free kick hit a post and the hosts maintained their momentum from the restart but were knocked back five minutes in when Calland picked up a clearance, proved too strong for the last man and knocked the ball past the keeper before running round to slot home. Red Star had a strong 25 minute spell and forced a fingertip save from James Bunn, saw a header hit the bar and a thunderous shot rebound from the angle before being rewarded with a well-taken Chadwick goal on the hour. A keeper’s miskick left Calland with the simple task of restoring the Rams’ three goal lead after 76 minutes. Chadwick completed his hat trick from the spot with 10 minutes left but the impressive Jacob Turner released Josh Baines to complete the scoring with an assured angled finish. An under strength Warley Rangers were put to the sword by Shelf United as their league slump continued. With nine players unavailable and no recognised goalkeeper the visitors went down 5-3 with Harry Talbot scoring three times. Shelf romped into a four goal half time lead. Billy Grogan’s chip and strike partner Talbot’s blast made it 2-0 inside 10 minutes. Warley lost forwards Connor Bell and Carlton Balmer to injury and Paul Dixon and Talbot added to next-to-bottom Shelf’s tally. Shelf seemed to ease up after the break while Rangers continued to battle. A Martin Boon double suddenly left Shelf looking a little nervous but Talbot completed his hat trick from the spot before Boon also completed a hat trick with a penalty in added time. Copley’s quest for a first win goes on after they lost 6-2 at home to Midgley United. Midgley had plenty of possession and after Rob Stansfield had given them the lead Steve Senior’s back post header made it 2-0. A Gary Ash penalty cut the deficit and although Stansfield got his second from close range, Copley stayed in the hunt going into half time thanks to Danny Dewick’s free kick. Midgley dominated in the second half. Senior restored the two goal margin, Stansfield completed his hat-trick with a good finish and Steve Fullard completed the scoring. 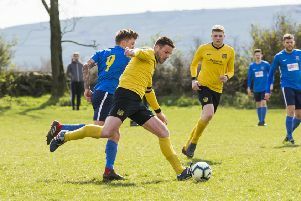 Shelf FC’s frustration at the postponement of their West Riding Trophy fifth round game at Pannal Sports must have been tempered by news that Division One title rivals Sowerby Bridge had dropped two points. Bridge were held 2-2 at home by Brighouse Sports. Luke Maguire and Oliver Coates scored for Bridge with Nathan Shaw and Tom Drake on target for Garry West’s visitors. Calder ‘76 Reserves bagged three points for the third Saturday running, beating Salem 3-1. Three of the goals came from penalties, Simon Reekie getting two of them for Calder, including his second at the death which settled a close contest. Denholme United’s Jack Harrison bagged six goals in Denholme’s 9-5 home win over Greetland Reserves. There were also hat-tricks for his teammate Michael Midgley and Greetland’s Andy Hurcombe. Another player among the goals was Holmfield’s Craig Gladwin. His three goals helped Holmfield beat visitors Elland Allstars 5-1. There were nine different scorers as visitors Ryburn United Reserves beat AFC Crossleys by the odd goal in nine. Junction Inn beat visitors Illingworth St Mary’s Reserves by 6-2 in a battle of promotion contenders in Division Two. Ryan Barkham and Damon Ambler scored twice each as Junction dealt a potentially fatal blow to Saints’ title hopes. St Columba’s fell behind to an early Pearse Finnegan strike but came back to win 5-2 against Sowerby United Reserves. Saints drew level when a Jack Dobson cross was headed home by Ben Caldwell and they took the lead when Kutubo Touray volleyed in off the underside of the cross bar. Scott Holmes extended the lead before half time. George Cook came off the bench at half time and he picked up a couple of opportunist goals, Sowerby’s late response coming from the penalty spot after Finnegan was brought down by Touray. Liam Calvert struck five times as Plummet Line ran out 7-1 victors against Sowerby Bridge Reserves, who started with less than a full complement. Calvert missed a one on one before opening the scoring by lobbing the keeper from 20 yards out. Once Bridge got up to full strength, they equalised directly from a Daniel Mitchell corner. However, Plummet played some of their best football of the season with Jake Meade and Joe Grimley linking well. Calvert added two more before the break with some clinical finishing. Calvert grabbed another two goals in the second half, including an excellent close range header from a well placed Matty Grady free-kick. Midfielder Phil Bailey sent a 20-yarder into the top corner before Jordan Winter was upended and fellow substitute Andy Frost slotted the penalty. Northowram Reserves’ tremendous winning run continued with a 4-1 home derby success against Shelf United Reserves while AFC Crossley’s Reserves ended a desperate run with a 7-4 win away to Salem Reserves, Gareth Anderton (three) and David Oakes (two) inflicting the bulk of the damage.